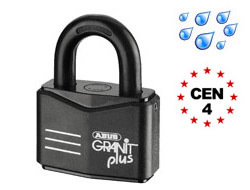 As a padlock this is one of the most secure on the market with a CEN rating of 4. It also it granted the status of Marine Grade which means it is fully weatherproof and suitable for outdoor use including being subject to salt water. The locking mechanism is double bolted and uses an ABUS Plus mechanism with over 250,000 key variations. This allows us to produce huge masterkey suites and guarantee zero duplicates. Important: Although each padlock will arrive with two keys each as standard, please remember to include the number of actual Master Keys you require with the order. Each lock will come with two keys each included in the price of the lock though. 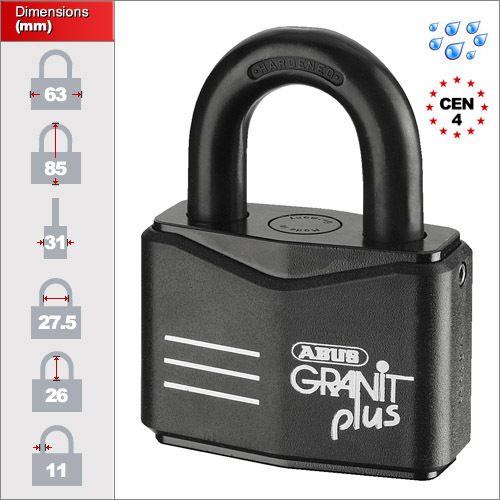 There is only one size in this model but the Closed Shackle Granit padlocks are available in larger sizes.